~ 30 mini chinese dumplings (450 calories). I love these cute little dumplings, I always grab a bag of frozen ones when I'm at a Chinese supermarket. They're about the size of the first segment of your thumb, so I always call them thumbnail dumplings. 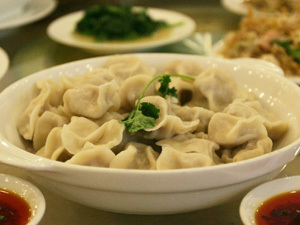 But in actuality, I've discovered that they're popularly called "pearl dumplings" or "zhen zhu shui jiao" (珍珠水饺) in Chinese. It's a nice name don't you think? I think 3 of these mini ones equal one of the larger traditional dumplings. But anyway, this was a late lunch, since I regularly wake up late on the weekends. I shared about 3/4 of a frozen bag's worth with my boyfriend, using my trusty ricecooker to boil them so that I wouldn't have to leave the room. Yum! I like to dip mine in some hoisin sauce, and my boyfriend likes to make a little emulsion of soy sauce and sesame oil for his. 1 snack size bag of Popsecret 100 Calorie Pop Kettle Corn (100 calories). I generally dislike popcorn because it tends to get stuck in my teeth and my throat, and the monotony of the butter flavor fails to excite me. However, kettle corn is an entirely different beast, with a subtle butter flavor accentuated with sugar. These cute little snack size bags are an easy snack and really good for you. 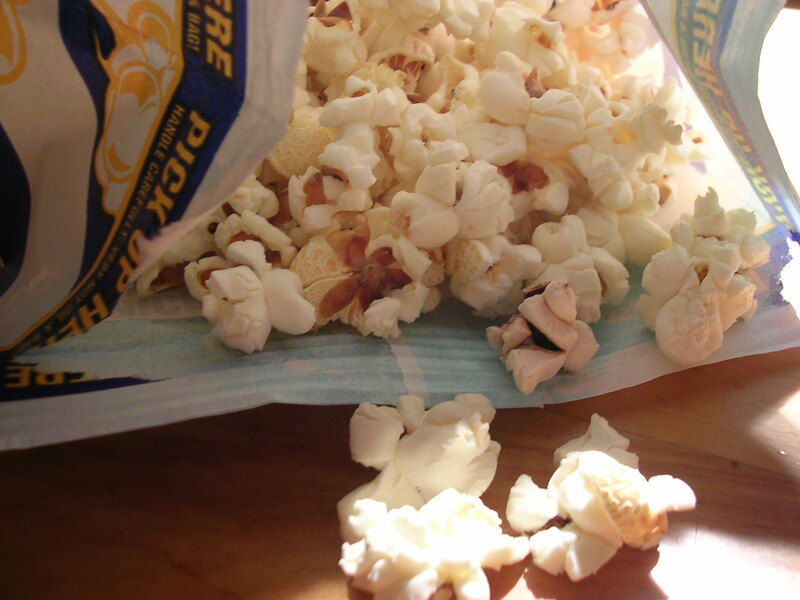 Popcorn has a good deal of fiber, with relatively few calories. The kettle corn is especially good because there is less butter and the sugar happens to be Splenda, which doesn't taste very fake at all. I needed something to fill me up while I wait for my boyfriend to finish his work at his lab so we can order out for dinner. I think it won't be until 10 or 11, so it'll be a while. Total for today is about 1300 calories. Pretty good, considering that I ordered out. 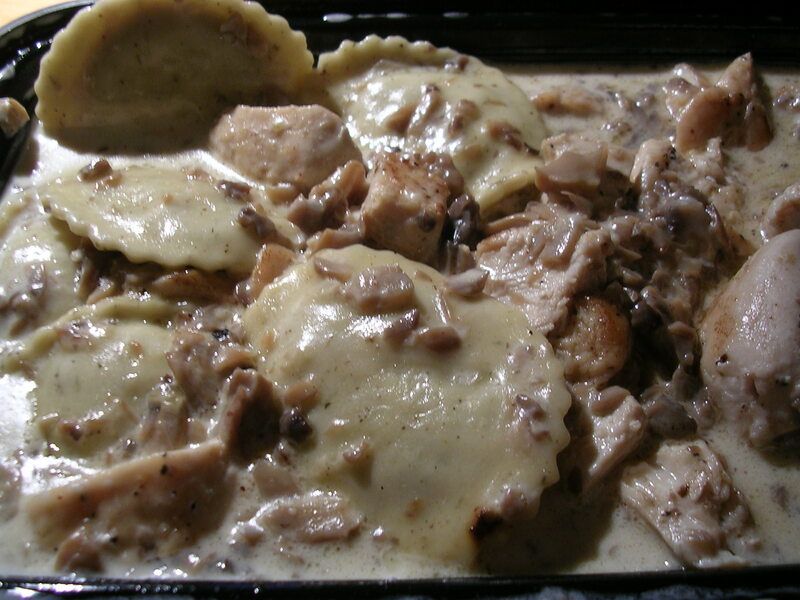 I think it really helped to plan out ahead of time that I wanted to save half of my mushroom ravioli entree. It was also really helpful that I could physically count the number of raviolis I was eating, so I could stop halfway without overestimating. This entry was posted on Saturday, March 10th, 2007 at 11:02 pm	and posted in Chinese, Italian, pork, rice and pastas, snacks, Uncategorized, vegetarian. You can follow any responses to this entry through the RSS 2.0 feed.